On hard ground, the inner curved hooves may not appear. In snowy terrain, a heavy foot drag is evident. Resembles that of bison. In summer, it forms patties. In winter, pellets form as a result of little moisture in the muskox's diet. Muskox (Ovibos moschatus) are northern animals well adapted to life in the Arctic. At the close of the last ice age, muskox were found across northern Europe, Asia, Greenland and North America, including Alaska. By the mid-1800s, muskox had disappeared from Europe and Asia. By the 1920s, muskox had also disappeared from Alaska as well, with the only remaining muskox being found in east Greenland and Arctic Canada. International concern over impending extinction of this animal led to an effort to restore a population in Alaska. In 1930, 34 muskox were captured in East Greenland and brought to Fairbanks. This group was then transferred to Nunivak Island, a large island in the Bering Sea. The muskoxen thrived there and, by 1968, the herd had grown to 750 animals. Muskox from the Nunivak herd were later translocated to establish new herds on the Seward Peninsula, on Cape Thompson and Nelson Islands, in the Arctic National Wildlife Refuge, and on Wrangel Island and the Taimyr Peninsula in Russia. 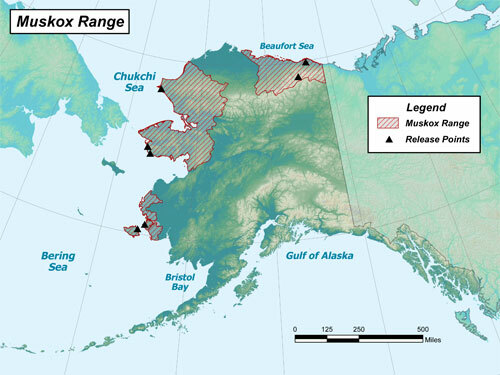 By 2000, almost 4,000 muskoxen existed in Alaska. In recent years, the herds in the Arctic National Wildlife Refuge and adjoining areas have declined. The harvest of muskox in Alaska has increased steadily in recent years. For example, 98 animals were harvested in 2003, and 258 were harvested in 2007. The muskox is a stocky, long-haired animal with a slight shoulder hump and a very short tail. Both sexes have horns, but the horns of bulls are larger and heavier than those of cows. See the muskox hunter orientation page for tips on muskox identification. Mature bulls are about 5 ft high (1.5 m) at the shoulder and weigh 600 – 800 lbs (273 – 364 kg). Cows are smaller, averaging approximately 4 ft (1.2 m) in height and weighing 400 – 500 lbs (182 – 227 kg). An 800-lb muskox will dress out at about 480 (218 kg) lbs, providing roughly 275 lbs (125 kg) of meat. Muskox eat a wide variety of plants, including grasses, sedges, forbs, and woody plants. Muskoxen are poorly adapted for digging through heavy snow for food, so winter habitat is generally restricted to areas with shallow snow accumulations or areas blown free of snow.